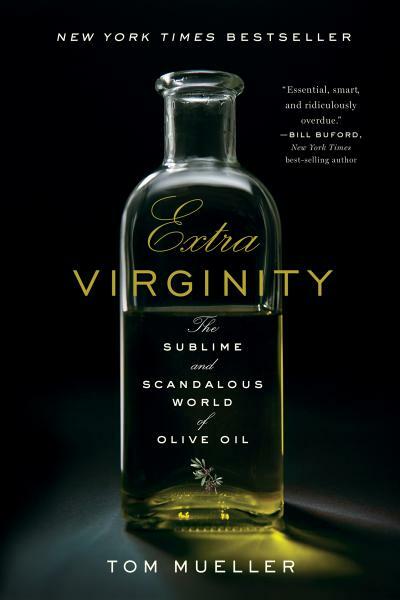 I just finished reading Tom Mueller’s eye-opening book ‘Extra Virginity- The Sublime and Scandalous World of Olive Oil’. Spurred by a sound bite in Lynne Rosetto Kasper’s e-book that I recently reviewed, I checked Tom’s book out of the library and within a few chapters became fully engrossed in the disreputable world of olive oil. If you consume olive oil in any form and have never taken the time to understand this grossly misrepresented commodity, it’s worth it’s weight in liquid gold to take some time and understand just what you’re spending your dollars on in the market. Olive oil is one of the most corrupt, mislabeled and fraudulent commodities in the world. Long embroiled in a battle of power and criminal activity, olive oil going back to ancient times has been undercut with lesser oils, and undergone intense chemical processing, then poured in to a pretty bottle and slapped with the Extra Virgin Olive Oil label before being sent around the world to wholly unsuspecting consumers. Tom’s book outlines in great detail the history of olive oil use in the world, for health, beauty and most importantly, commerce and trade, and does an excellent job of understanding the labor-intensive process of making top quality oils. It’s this time-honored process that creates the best olive oils, but many of the finest oils produced in the world never make it to a consumer’s table. And the creation of true extra virgin olive oils results in a product with an incredibly short shelf life. The doctored and adulterated oils created for profit make an oil that is far more stable, with an ability to be stored for extended amounts of time -years even- before being bottled and shipped around the world. The fraud in olive oil production goes back for centuries, for as long as olive oil has been produced, for as long as it has held high esteem as one of the most valuable commodities in the world. And up until recent years, there has been no fail-safe measures in place to stem the flow of poor quality oils in to consumers hands. Olive oil production was often driven by unscrupulous ‘oil bosses’, shady under the table deals and back alley transactions, shipments of true olive oil that went ‘missing’ only to turn up months later after having been completely undermined, or even fully replaced with poorer quality oils like cottonseed, corn, soy and other vegetable oils. With a small amount of actual olive oil, and an added color agent, oils were bottled in huge factories all over the globe, slapped with an Italian inspired, Extra Virgin Olive Oil label and marketed as the real deal. And consumers bought it eagerly, and wholly unaware. It is estimated that close to 90% of extra virgin olive oils in the supermarkets are not even close to the real thing. And what’s worse, there is an entire population of food-forward consumers who have no idea what true extra virgin olive oil should even taste like, and when confronted with a pure oil, they tend to reject it due to it’s strong, pungent and overpowering taste. But if a true extra virgin olive oil doesn’t make you cough just a little, or make your nose run and eyes water, then it’s likely you don’t have a true olive oil in hand. If you’ve never done an olive oil tasting, I strongly encourage you to do so. A very detailed description of how it’s done can be found at The Olive Oil Times, in this post. If you’re going to purchase olive oil, it’s in your best interest to know the facts and understand what makes for a good oil, and more importantly, how to shop for a quality extra virgin olive oil in the markets. Your best bet is to look for an actual production and harvest date on the bottle of oil, and also an expiration date; the further out the expiration date, the fresher the oil. True Italian olive oils should have the DOP (Denominazione d’Origine Protetta) designation as well. This is a guarantee from the European Union to insure the identifiable character of a region, with specifications on production and character unique to that region. I’ve done numerous olive oil tastings and rarely buy more than a few trusted brands of olive oil to use at home. Most of my cooking is done with coconut oil, but I love keeping a really good bottle of olive oil on hand for topping salads, soups and stews, or to drizzle over grilled breads and for brushing on pizza crust and focaccia. Mueller’s website, Truth in Olive Oil, lists many wonderful brands of oils that are readily available to consumers without access to a store that specializes in selling bulk olive oils, which he considers to be the best means of procuring the finest oils. Three of the four brands of oil I purchase are on his list of good quality oils- Lucini Italia (hands down, this is one of the best olive oils I have ever tasted and well worth the cost), Toscano olive oil (found at CostCo and an excellent every day oil, also exceptional for baking), and California Olive Ranch (their everyday oil is a beautiful product and very reasonably priced), with Academia Barilla being the one brand I purchase that’s not listed as of yet on Tom’s site. How much do you truly know about the content and origin of the olive oil that you use? And what brand of olive oil do you regularly purchase? Hi Kate – I have that book (given to me by a friend) and started it some months ago, then got distracted and put it aside. It was quite riveting, at least what I’d read. I’ve heard (maybe it was part of an amazon review? don’t remember) that the author has taken a whole lot of literary and industry heat, some totally refuting his theories. I’ll have to dig it out and start reading it again. I did go so far as to look at the ridiculously fine print on the back of olive oil bottles to read where the oil came from. One very well known label said (on the front) that it was Tuscan olive oil, when in fact most of the oil was from Morocco, Spain and Italy was way down the list. I’m buying mostly California labels or from olive oil bars these days, but that may not be any more reliable. Wow, apparently I know nothing about olive oil! I will have to get Hubby to read this as well since he does a lot of the cooking.